This is what I had for lunch recently. 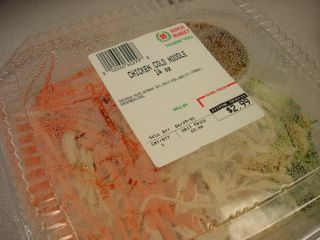 Picked it up from the 99 Ranch in Irvine (on Culver) for $2.99 in the refrigerated section. It was quite filling. In fact, I had to give the half I couldn't finish to a co-worker. The ingredients are quite simple. Noodles, shredded chicken, shredded carrot, and shredded cucumber. The sauce is what makes the meal. It is a blend of peanut butter, sesame, soy and garlic. The garlic packs a powerful punch. A breath mint or a toothbrushing is required after this meal. Here it is when it has been fully tossed. We arrived quite late in the afternoon on Saturday. It might have been around 2 pm. We waited only a short time, perhaps around 5 minutes and got a table. But alas, the table was in the side room, not in the main dining hall. 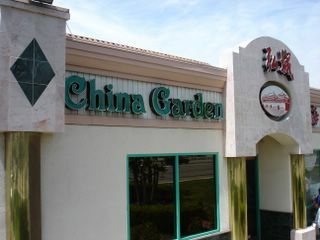 This was not our first time at China Garden. This was probably our third or fourth, but by some cosmic force, every single time we did, we always get a table in this side room. The problem with the side room is this; the carts do not come around often. Those that did were carrying the same items we saw already. We saw the turnip cake tray come around three times before we ever saw the shu mai, which came once, and only after our repeated urging with the guy who refilled our tea pots. I'm more and more inclined to go to Sam Woo now. Because first, they don't have a side room, and also there's a menu that one could order everything in one fell swoop. I know, it takes away from the dim sum experience, but you weren't there in that side room last Saturday with a growling stomach. Service and the undesirable location of our table notwithstanding, we had good dim sum. First was the turnip cake. Still hot and crispy on the exterior. 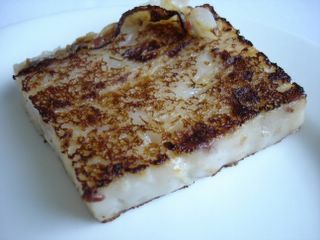 I loved how the pudding-like texture played against the thin caramelized crust and the chunks of turnip. A good dip in chili paste completes the experience. Then it was the taro balls. Filled with lightly curried minced meat, these delectable morsels are crispy and lacy on the outside, giving way to a warm starchy mash when bitten. Yummy! 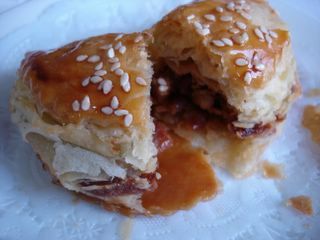 The BBQ flaky pastry was to die for. Probably the most surprising thing about this item was that it had a honey glazed crust that exploded with flavor. The cha su filling was sweet, savory and porky. Next we picked out a palate cleanser; marinated seaweed. Luminous and green, it looked striking on our table. 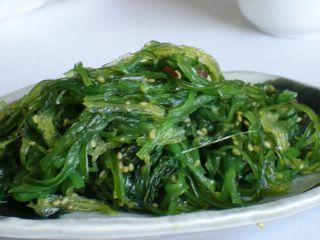 Clean and crunchy with the essence of the sea and a hint of sesame oil. Then we had some tripe and braised pork short ribs. 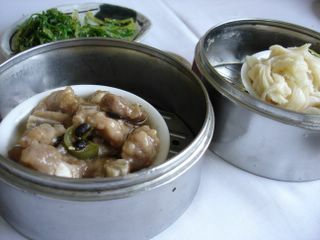 The tripe was simmered in a velvety sauce. It was rich and fatty, filling my mouth with tripy goodness. The tripe was just the way I like it. Not overly chewy, it was spiked with a good bit of ginger. The pork short ribs were also good. I would have liked a little stronger black bean flavor on it though. Finally, the cart with the rice flour wrapped shrimp finally came. I forgot what these things are called. 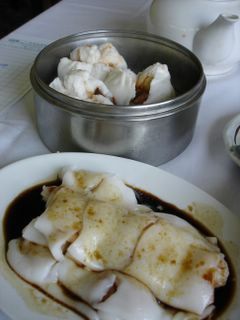 Basically a sheet of rice flour, sort of a wide soft noodle is wrapped around steamed shrimp. 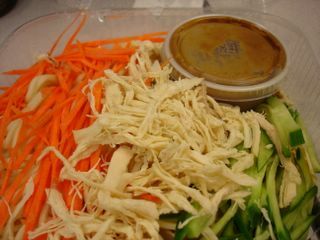 The whole thing is then doused with a sweet soy sauce. The texture is a dreamy. Glutinuous and warm. Cha su buns promptly followed. Good and sweet. 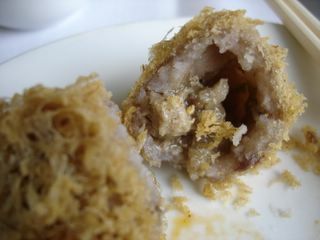 Typical cha su bun, nothing all that special, but still a must for any dim sum outing. The shrimp har gow was okay. The skin seemed to be stickier than usual, and quite thick. 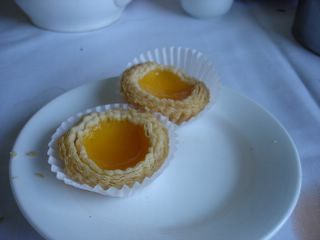 We finished with a few egg custard tarts. They had a light, sweet, flaky crust contrasting the cool custard; one of the better renditions I've had. It felt like we were being unfaithful, my girlfriend said. "We should go over there and say hi," I joked. We were in Cypress...in the parking lot of our favorite restaurant: Cafe Hiro (see previous posts on the subject). But we weren't going to Cafe Hiro. Instead, we were going to try California Fish Grill, and do it we will, dammit! So we did. We dutifully walked from our car to California Fish Grill's door, Cafe Hiro still in our peripheral vision. We swung the door open and looked around. It wasn't what we expected at all. It's a casual place. You order at the front counter, pay, and they give you a number card and a metal stand to prop it up on the table that you choose yourself. It's like a Wahoo's Fish Taco. They even have fish tacos on the menu. 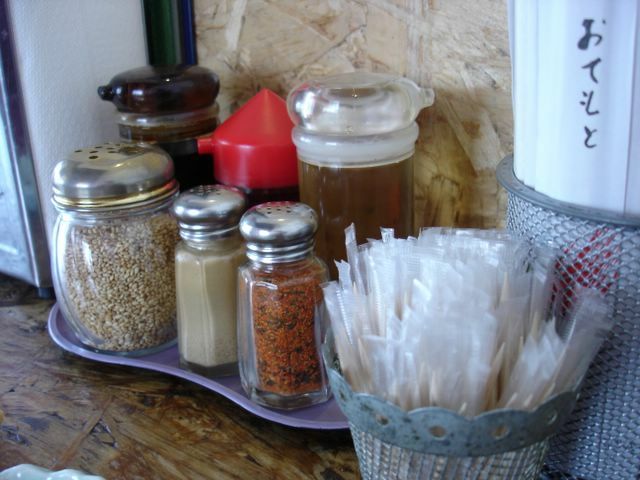 And there's a salsa bar and a beverage bar like any casual dining establishment. And the prices were quite reasonable too. Nothing over $10, while most hovered around $8. I ordered the Grilled Ahi Tuna for $8.49. The ahi steak was served on top of mound of skinny fries which were dusted with parsley. A scoop of coleslaw and a slice of french bread came with it too. The fish was nicely cooked (not rare, although I could've probably asked for it). Grill marks were evident. 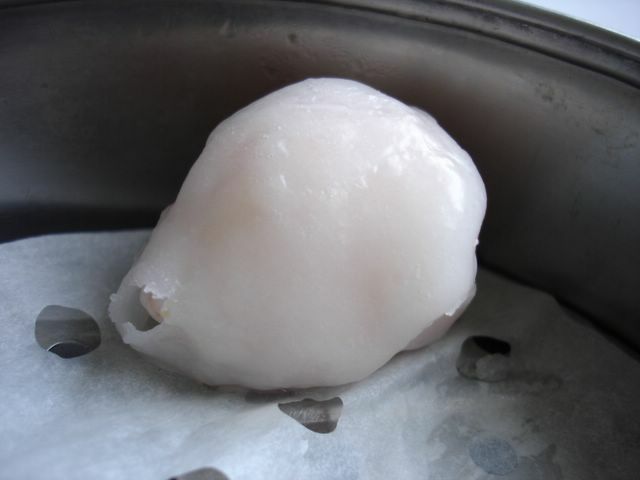 The flesh was flaky, sweet, and not at all fishy. It was simply glazed with garlic butter, which imparted a nice garlicky twang and creamy richness. A meal like this would probably have set me back at least $15.00 at King's Fish House or Fish Market. What a deal at just under $9! But don't worry Cafe Hiro, nothing can replace you. Finally made it to Hakata Ramen - Shinsengumi for lunch. First, the service. Unbelievable! If they were any more accomodating, they'd be spoon feeding me and wiping my mouth. The minute I stepped out of my car, a waiter held the door open and greeted me. As soon as I seated myself at the bar, a complimentary glass of iced tea arrived. Throughout my meal, everyone working, from the two waiters to the two noodle jockeys, greeted every customer who entered with a hearty and sometimes a little too loud "Irashaimase!" Everyone working was probably in their twenties. One cook was particularly energetic, dancing and humming in tune to the piped-in hip hop music. The waiters hover and dote on customers constantly. "How's the fried rice?" "Would you like more noodles?" A bit much for a ramen joint you might say? Yeah, probably. But too much service is better than too little. I've been to Shinsengumi's Robata Yakitori next door, and got the same over-the-top service there once. I just didn't expect the same in a noodle joint. So now the food. I ordered the A-Set lunch which is a bowl of their special pork ramen and a plate of pan fried gyoza. These gyoza were tiny, cute little things, about the width of two dimes. 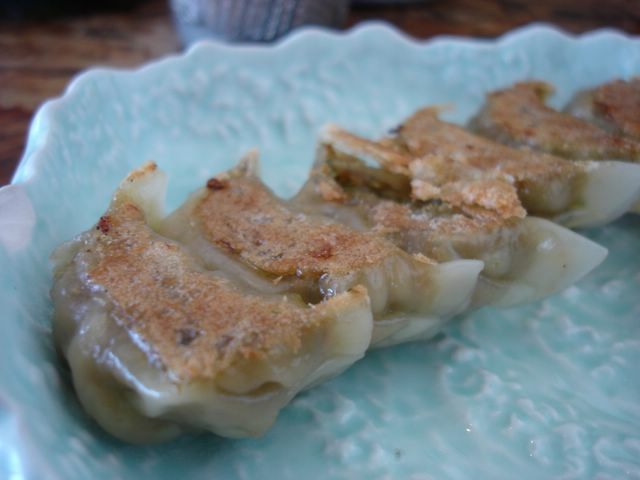 Filled with a teaspoon of pork and scallions, they were perfectly crisp. Dipped into a slurry of soy, vinegar and chili oil, I scarfed it all within a minute. 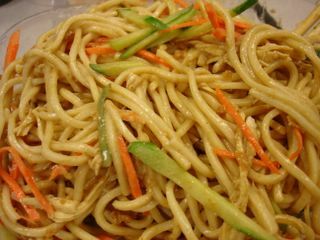 Now came the noodles. I forgot to mention that when you order, you do so by writing what you want down on a sheet of paper. You indicate how you want your noodles. Will it be "firm" "normal" or "soft"? As for the broth, will it be "oily", "normal" or "no oil"? I opted for "normal" for all. So about the noodles. Firm yet still supple, with a nice bite and good clean taste. There was a good bit of it too, or maybe I wasn't that hungry coming into this lunch. 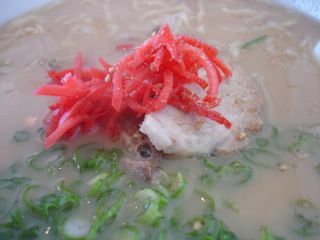 The soup was tonkotsu style, made by rigorously boiling pork bones for hours. Very murky, milky, it had the color of light caramel. This elixir was warm, but not hot. I would preferred it if it were hotter. At Santoka, in the Mitsuwa Marketplace, I routinely burn my tongue on their broths. I'd be swearing afterwards, but then I remember a scene in the movie, "Tampopo", where Goro says to Tampopo, "He shouldn't be able to drink the soup so soon! The soup should be HOT!" The flavor of the soup was somewhat subtle. Rich and porky, but also light and clean. This is different from Santoka. I'm not sure which one I liked better. Perhaps this would be more of a soup for a spring day - slightly rich but not too heavy. Santoka is for winter - full bodied and assertively porky. The one thing I didn't get was the tuft of pickled ginger they put on top of the soup. It is to me, just a little weird. The taste just seems out of place in a ramen soup this subtle. The sliced pork was tender and but tasted a little pasty. A bit more heft and fat would have done the soup good. As I asked for the check, the waiter thanked me in Japanese and bowed ceremoniously. Dang! What a production! And I loved it! The total for the lunch was $9.00 with tax and tip included. Pricey? Yes. Worth it? Yes. You wouldn't think a bowl of porridge, especially one priced at $2.50 would be worth mentioning, let alone writing the following wordy essay about. But I was craving something to soothe my sore throat and it hit me; Arroz Caldo. Yes, that's it. I thought! A bowl of steaming, hot congee, made with chicken stock, generous chunks of tender chicken meat, chopped scallions and crumbled fried garlic. Man, would that hit the spot! And it did. The styrofoam bowl, filled to the brim with this most comforting of comfort foods, looks ordinary enough. 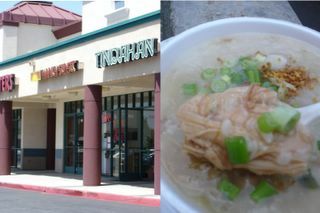 The color of the chickeney, light congee (rice porridge) was barely yellow, more of a dull white. If it weren't for the sprinkling of green onions, it would be downright monochromatic. Then you dig in with your plastic spoon, and you find tender slightly pink chunks of boneless chicken thigh. You slurp a few spoonfuls. The unmistakable depth of chicken stock fills your mouth, while the velvety texture of the congee soothes. The fried garlic pieces, golden and crisp, is used sparingly, just enough to get a few bursts from these flavor crystals now and then. The scallions provide a bit of spiciness and herbiness, like counterpoints to a melody. A simple dish for a measly price ($2.50), but one that, in my opinion, is worth every word I've written and every cent I spent. *Note: Manila Sunset of Fountain Valley has gone out of business. 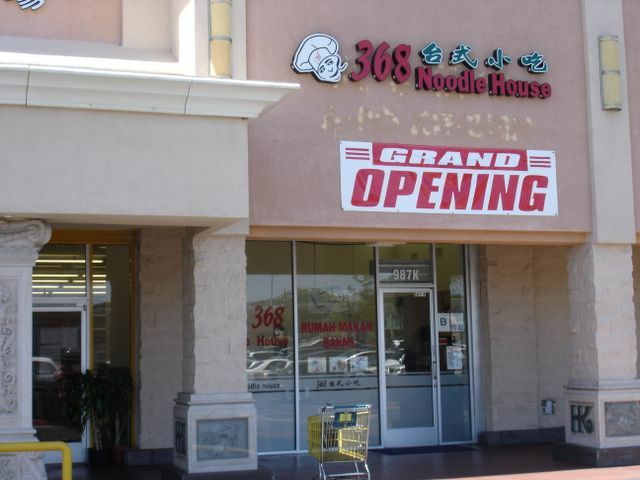 There's a new hole in the wall in West Covina called 368 Noodle House. It's located in the Hong Kong Plaza on Glendora Ave. They have your typical Chinese noodle soup menu, but since it is owned and operated by an Indonesian family, they also do traditional Indonesian dishes. I recently tried the Nasi Campur ($5.50) which was a dish of steamed rice with a sampling of various Indonesian stewed items. 4. Fresh cut cucumbers topped with a spoonful of sambal (Indonesian chili paste) There were supposed to be two vegetable items on the plate that they had run out of, but for what I got, I was satisfied and quite full. This dish was like a single serving rijstafel. They also serve "Ayam Goreng Suharti-style" Fried Chicken ($6.00). Which is a side of chicken deep fried and topped with what I can best describe as a crispy fried confetti made of flour and coconut. The chicken is served with steamed rice and a garnish of "lalapan" - a few cucumbers, lime, and sambal for dipping. The trick to eating this is to get some of the crispy stuff with every bite of the moist chicken. Another item we tried from the Indonesian menu was the Nasi Gudeg ($5.50), which is a rustic stew of young jackfruit (sweet and savory), a light orange stew of chili and pork rinds (goopy and great), cooked tofu (firm and sweet), egg, and chicken leg, all served with white rice. Sambal and sliced cucumbers was also included. The jackfruit stew was as good as I've had in Indonesia. This was a substantial dish though, and probably quite exotic and daunting for the uninitiated. Although, save the jackfruit, nothing in the main ingredients should be too intimidating to someone who might want to explore. The Indonesian menu is advertised on a little card propped up on each table. It says that the Indonesian meals are only available on weekends, but more often than not, they will offer it all the time, since most of the clientele seems to be Indonesian, and I was there on a Wednesday night. 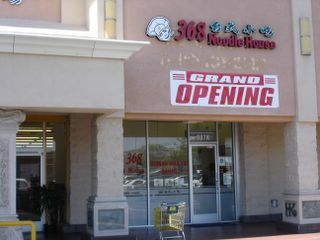 So, with this new joint, the small Indonesian specialty grocery shop, Janty Noodle and Satay Fong inside the Hong Kong Market plaza and Surabaya Restaurant down the street, West Covina is shaping up to become some sort of small Indo-Town.